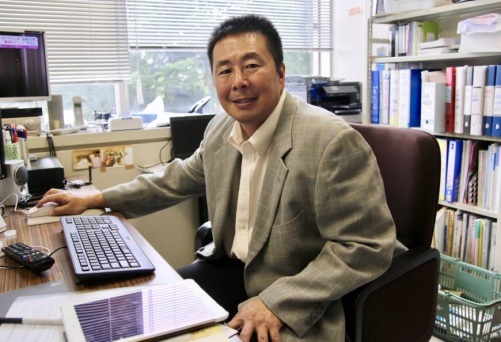 Edogawa University professor Itaru Kobayashi, seen in his office, is a leader in the push to modernize the nation's college sports. Discussions over the introduction of a “Japanese version of the NCAA” to oversee this country’s collegiate sports have prompted positive and negative reactions since they began last year. Sports management expert and university professor Itaru Kobayashi is one of the scholars who supports the project and insists that a collegiate governing body, which has never before existed in Japan, would take the nation’s college sports to a higher level. Between last fall and this spring, Kobayashi served as the chairman for a government-led council to discuss the promotion of college sports by establishing a sports governing body here like the National Collegiate Athletic Association. The NCAA, which was established in 1906 as the IAAUS (Intercollegiate Athletic Association of the United States), oversees collegiate sports and organizes many of the collegiate athletic programs in the United States and Canada. The Japanese government drew up an economic revival strategy last year, and as part of that it set a goal to expand the country’s sports revenue from ¥5.5 trillion in 2015 to ¥10 trillion in 2020 and ¥15 trillion in 2025. College sports have been highlighted as an area with significant room for improvement, including from a business perspective. While some are skeptical about installing an NCAA-style structure in Japan, with athletic departments at each university, Kobayashi is confident that it would have a positive influence in many ways. Kobayashi believes that a Japanese NCAA would not only help monetize college sports here, it would also lead to better organization. Unlike in North America, sports teams are not officially recognized entities at Japanese universities. They get support in terms of renting facilities and receiving some subsidies, but the athletes mostly pay their own way, including insurance, and teams also rely on donations from former student-athletes. The coaches are mostly volunteers and they are not given insurance, meaning schools assume that they do not have to take responsibility when athletes are injured during club activities. Some people are critical about monetizing collegiate sports, saying that it is inappropriate to “use” college sports as financial resources. But Kobayashi argues that it is not necessarily a negative thing if the money is spent on giving the athletes and staff the right conditions, which he thinks is not the case now. He added that financial hurdles should not prevent college students from playing on athletic teams. “If (the right circumstances) can help them out, we want to do it, we should do it,” Kobayashi said with a smile, adding that the plan would not generate a huge amount of money like in the U.S.　Kobayashi also said that it would raise the status of Japanese collegiate athletics by having a governing body and legitimate athletic departments, which administrate all the athletic programs within their own schools. The Kanagawa Prefecture native identified other potential benefits of having a Japanese NCAA, such as encouraging more student-athletes to excel both academically and athletically, giving more financial aid and exposing minor sports to the spotlight. The Japan Sports Agency announced this spring that the proposed college sports governing body would officially be formed during the 2018 fiscal year. Then, the next step will be to set up athletic departments with athletic directors at universities. Kobayashi said that roughly a little under 40 percent of the 777 universities in the country “are considering their interests” in moving under the umbrella of a governing body and installing their own athletic departments. Kobayashi said that local universities, especially in the Kansai area, are enthusiastic about it, but universities around Tokyo are not as keen, although there are exceptions like the University of Tsukuba and Waseda University, which are committed to the whole idea. In U.S. college sports, prominent athletic performances sometimes play a big role in attracting applicants. But Kobayashi said that Tokyo universities do not really need further help as they can secure enough students under the status quo. And he believes that there is no need for hundreds of universities to get involved, but thinks starting with a limited number of schools as long as they set a good example is workable. Kobayashi half-jokingly said that Japanese society has always tended to give in when it comes under pressure from outside, or when the political authorities take the initiative. The education ministry and Japan Sports Agency have led the project, and Kobayashi hopes that their “powerful leadership” can realize the plan and put Japanese college sports on the right path.